The European populace might finally hold its leaders accountable for their continued failure to react forcefully to the threats of radical Islam following the deadly attacks in Brussels. Opponents of German Chancellor Angela Merkel's open borders policy already rebuked her with historic gains in recent elections, which might mark the beginning of a larger pattern. The Investigative Project on Terrorism (IPT) predicts that Europe will experience much more violence over the next 18 to 24 months, according to our extensive analysis of global Islamist terror trends. Should it materialize, voters will revolt. 1. ISIS will maintain its strength in the Middle East and cause greater instability in countries like Jordan, Turkey, and Saudi Arabia. 2. Jihadists will continue their ascendance in northern Africa and will significantly destabilize other areas throughout the continent. 3. The humanitarian crisis will persist unless NATO and the U.S. fundamentally change their tactics and strategies to address its root causes. The trends will considerably impact Europe because it is located on the front lines of the instability and humanitarian catastrophe. The unregulated migration of hundreds of thousands of refugees from terrorist safe havens in Syria, Iraq and Libya has created a very difficult threat environment for Europe. All three countries are failed states with no records that would allow any vetting of those attempting to gain entry into Europe, creating a situation in which jihadists easily mix with those seeking safety. Manufacturing false documents is a lucrative business for ISIS. Europe's social services and law enforcement organizations will become overwhelmed. They will be unable to maintain civil society and prevent terror attacks. The primary role of government is to provide for the safety and security of their populations. The Europeans are failing miserably. 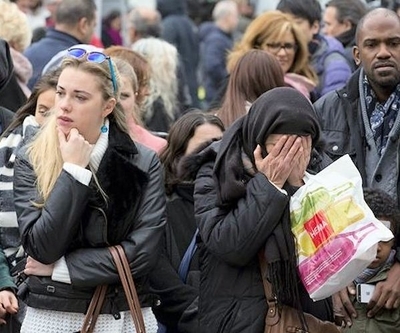 Perhaps the assaults on the Brussels airport and subway that left 34 people dead and hundreds wounded will shock political authorities into finally responding to a crisis that they have tried so hard to avoid and that has cost far too many lives. Europeans are rightfully angry with the decisions that their elected authorities have made. Americans have reason to share that anger because the threat is not all that distant from our shores. Our leaders advocated for overthrowing dictator Muammar Gaddafi. Libya has since become a failed state and now an Islamic caliphate. Europe has been slow and half-hearted in addressing ISIS in Syria and Iraq. Finally, European leaders threw open their doors to allow millions of unvetted migrants to enter. Taken together, it is a record of failure. Europe was at risk before Brussels. Elected officials knew it but did little to stop it. IPT's contacts in Europe tell us that they wished they had addressed these issues when they first arose because they are now so much more difficult. Political authorities need to recognize and respond to the danger before the West reaches the point of no return, where Europe increasingly finds itself. The public in Belgium sees the threat. An entire country of roughly 11 million people went on lockdown. The electorate understands that their countries are in trouble, and they wonder why their leadership doesn't react with any sense of urgency. Why is leadership in such denial? Only this week as I met with friends at the American Israel Public Affairs Committee conference, they asked the question, "What will have to happen to wake up the United States, Canada and Europe to the threat from radical Islam?" The West needs leaders with the courage and the will to fight the scourge of radical Islam. The massacre in Brussels will hopefully provide that much-needed wake-up call, but don't hold your breath. If not, voters throughout the West will finally throw their spineless leaders out of office. Pete Hoekstra is the Shillman senior fellow at the Investigative Project on Terrorism. He represented Michigan for 18 years in Congress, including time as chairman of the U.S. House Intelligence Committee. He is the author of "Architects of Disaster: The Destruction of Libya." For more of his reports, Go Here Now.